When you're working in a hazardous environment, it’s crucial that the equipment used complies with legal safety standards. Rest assured that our ATEX certified rugged mobile computers all meet the protective standards set out in the ATEX directives. Each one has been specially designed for use in potentially explosive atmospheres to offer high performance data capture, no matter what conditions they’re used in. 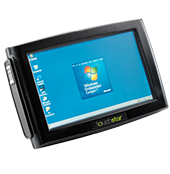 Our range covers tablets, vehicle mounted and hand held devices: the GETAC Z710EX with its image barcode reader, camera and touch sensitive screen which works even when wearing gloves; the Dolphin 99EXNI with its wireless technology and user-friendly interface and the TouchStar TS3000 which can be used either in vehicle or as a mobile device. screen which works even when wearing gloves; the Dolphin 99EXNI with its wireless technology and user-friendly interface and the TouchStar TS3000 which can be used either in vehicle or as a mobile device. Each product is configured by a qualified technician and comes with an all-inclusive support programme. For details, see our services page. To speak with an adviser to discuss your requirements, please give us a call on +44 (0) 161 874 5050 or send an email. Our TS8550i is built to withstand all sorts of extreme conditions, making it perfect for almost any work environment. Its variety of scanning options includes ‘Extreme long range’ and ‘Near far’, so it’s up to any job. Designed to work in hazardous areas, the ECOM Z710-EX rugged android tablet is designed to log a range of data on the go, thanks to its HF RFID reader, 1D/2D Imager barcode reader and 5 megapixel camera. Super tough and very reliable, our Touchstar TS3000 is perfect for all day use in dangerous environments. It’s primarily designed to be an in-vehicle device, but it can easily be detached and used on the go. The extremely durable, ATEX certified Dolphin 99EXNI is ideal if you work in an environment that could be explosive, such as an oil rig or laboratory. It’s incredibly user-friendly too.